SINGING AND PREACHING. Here is the kind of faith and community gathering I think Martin Luther King, Jr. would have liked to see on his birthday. On MLK Day each year, I make it a point to get together with other Christians and friends of other faiths to focus on the Biblical themes in the American civil rights movement and continuing civil rights challenges. But rarely have we done anything beyond singing and preaching--though these are very important and I enjoy them fully. Parenthetically: I've been thoroughly disappointed over the years at the near-total absence of white evangelical church congregations, leaders and laity at MLK gatherings. Why is that? BUT NOT JUST A CHURCH SERVICE. But I like what has started to happen in Indianapolis. After last year's interfaith MLK Day service at Christ Church Cathedral, we marched to Key Bank and protested its refusal to offer living wages and benefits to the custodial workers who service its downtown Indianapolis building. This year, it looks like we will engage in a justice action planning session. 11:00 AM TO 3:00 PM ON MONDAY. Central Indiana Jobs with Justice will be celebrating the grassroots community on Monday, January 19th in honor of Martin Luther King, Jr. From 11:00 - 3:00 p.m. there will be an interfaith worship service, all natural lunch ($8 suggested donation) and a planning session to ignite the social justice movement in Indianapolis. Location: Lockerbie United Methodist Church at 237 N East Street, downtown Indianapolis. Sponsors: Central Indiana Jobs with Justice, Earth House Collective, Indianapolis Clergy Committee, Concerned Clergy, Unite Here, SEIU and others. Call (317) 917-0723 x 33 for more info. 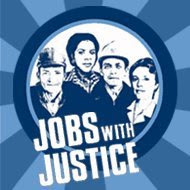 Learn more about/get involved with Central Indiana Jobs With Justice.